I am back and I am ready to rock and roll! I got my computer back and it is fixed and all set up in my office. Now I have to catch up on my e-mails, Facebook cruising, blog reading and most importantly start blogging like crazy to make up for all the time I was away! You would think that with swim-suit season right around the corner I would be cutting down on all the ‘hearty’ ‘manly’ foods. That I would be eating more salads, and grilled fish, and fruit. But no I am eating things like this meatloaf, meatloaf wrapped in bacon in fact. If you remember (I know it has been a long time) the cookbook I featured back in March was The Pioneer Woman Cooks: Recipes From An Accidental Country Girl; and because of the computer issues I had half way through the month of March I never got to finish my review of this cookbook. I debated and debated on whether or not I should go back and feature these recipes and the recap of this book since now we are almost half way through April; but in the end of course I have to share them. So like I said I guess my only option is to start blogging like crazy to get all caught up! Eric and I had mixed feelings abut this meatloaf. We were super excited to try meatloaf with bacon wrapped around it but I guess we thought the bacon was going to crisp up and add a different texture to the meatloaf but it did not. 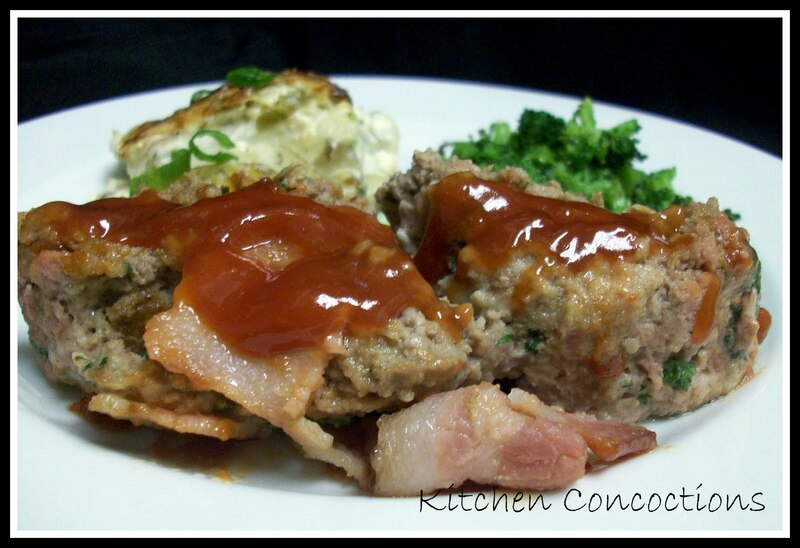 It was chewy but it did add a great layer of flavor to the meatloaf. The directions for the meatloaf say to cook ‘the loaf’ on a roasting pan so the juices (read fat) can drip to anther pan underneath. I did not do that so my loaf was swimming in the drippings which did make it moist and flavorful but as kinda gross pulling it out of that mess and trying to serve. I loved the ‘tomatoe gravy’ (or doctored ketchup) although Eric thought it was too sweet (I on the other hand thought it complemented the meatloaf/bacon well). Overall in the end we liked the meatloaf and will make it again (cuz now we know what to expect)! Note: I served this meatloaf with PW’s Creamy Rosemary Potatoes and my roasted broccoli. Preheat oven to 350. Pour the milk over the bread and let soak for several minutes. Place ground beef, milk soaked bread, parmesan cheese, salt, seasoned salt, black pepper and parsley in a large mixing bowl. Pour in the eggs. Mix the ingredients until well blended. Form the mixture into a loaf shape on a broiler pan, which will allow the fat from the meat to drain (make sure and put another pan underneath while baking so that the drippings won’t make a mess of your oven). Lay bacon slices over the top tucking them underneath the meatloaf. Pour 1/3 of the tomato gravy over the top of the meatloaf. Bake for 45 minutes, then pour another 1/3 of the remaining tomato gravy over the meatloaf. Bake for an additional 15 minutes. Serve with the remaining tomato gravy on the side as a dipping sauce. Pour the ketchup into a small mixing bowl. Add the brown sugar and dry mustard, and splash in the hot sauce. Stir the mixture until well combined. Glad that you're back! Now you can collect the award I have for you on my recipe blog!